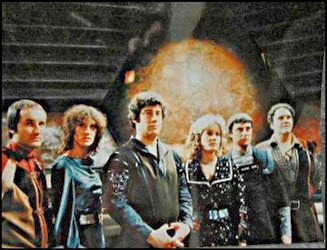 Blake's Seven first appeared on British TV screens on the 2nd January 1978. Although definitely not a spin-off of Doctor Who, the two shows do have some similarities: both were made by the BBC on very tight budgets, both shared creative and behind-the-scenes personnel and both had curly haired leading men. But that's where the similarities end. Whereas Doctor Who at this time was becoming more light-hearted and comedic, Blake's Seven was aiming at the opposite end of the spectrum. Set in a bleak, dystopian future, the series sees a small group of criminals turned freedom fighters waging a war on the mighty yet oppressive Galactic Federation. They are led by political troublemaker Roj Blake and have at their disposal a powerful, stolen alien spaceship that is superior to anything the Federation has. Although the series occasionally strayed into camp territory (it can be hard to take a group of intergalactic terrorists seriously when they look like they're about to head out to the disco) the series still managed to produce some gripping drama. The crew were in constant danger and no one was invulnerable. The spectre of Death constantly hung over the crew and, before the series ended, he would swing his scythe more than once. I've decided to re-watch and review the entire series and hope to post a new review every week, but don't hold me to that. We begin, appropriately, at Series A (the series' in Blake's Seven were always lettered rather than numbered) where Blake gathers his crew and begins his campaign against the Federation.